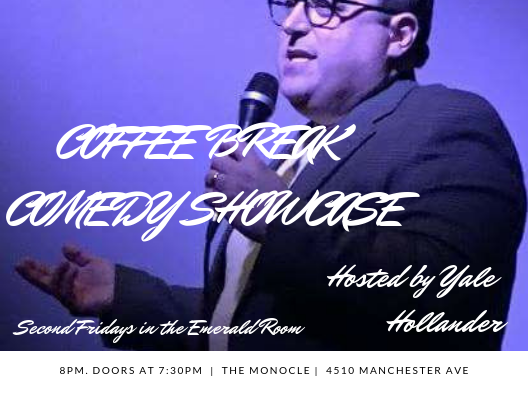 The Monocle is thrilled to present COFFEE BREAK COMEDY SHOWCASE hosted & produced by Yale Hollander! The weekly grind got you down? Perk up with some laughs from St. Louis' finest comedians as well as touring comedians. STL's longest-running monthly independent stand up showcase is moving into the Emerald Room starting on Friday, January 11, 2019 at 8pm. Catch a buzz with delicious drink specials & cold brew coffee. Tickets are $7 in advance and $10 at the door. The Monocle opens at 6:30pm. Come for a drink and stay for the show! Mark your calendars!